This would be the coolest thing ever. THE parched deserts of Southern California need water to transform their barren soil into fertile farmlands and tourist Meccas such as those existing elsewhere in the state. So far the problem has remained unsolved. But Sidney Cornell, a Los Angeles construction engineer, thinks he has a solution. He wants to construct a series of geyser-like power plants one mile apart to shoot water from the mouth of one into the funnel of the next, as depicted here by MI artist Frank Tinsley. The water would arc over hilly sections, have a flat trajectory over plains. Its velocity would approach 400 mph. These stations— 400 in all—would cost about $300,000 each. And what happens when the wind blows? How could anyone think this would be cheaper or lose less water during transit than ordinary aqueducts, even assuming artistic license in making the catch areas smaller than needed? And I don’t think southern California had a surplus of water to use in this fashion anyway, then as now it was needed in Los Angeles. Obviously designed by someone with no understanding of hydraulics and the spread of water from nozzles. And assuming that they made catch basins large enough to reduce loss from splashing and diffusion of the stream in the air, we’d still be looking at thousands of these things just to move water a a hundred miles. The power consumption would be incredible. This is the first time that just reading the idea and looking at the picture has made me laugh out loud. Obviously the guy has never used a hose in the wind. 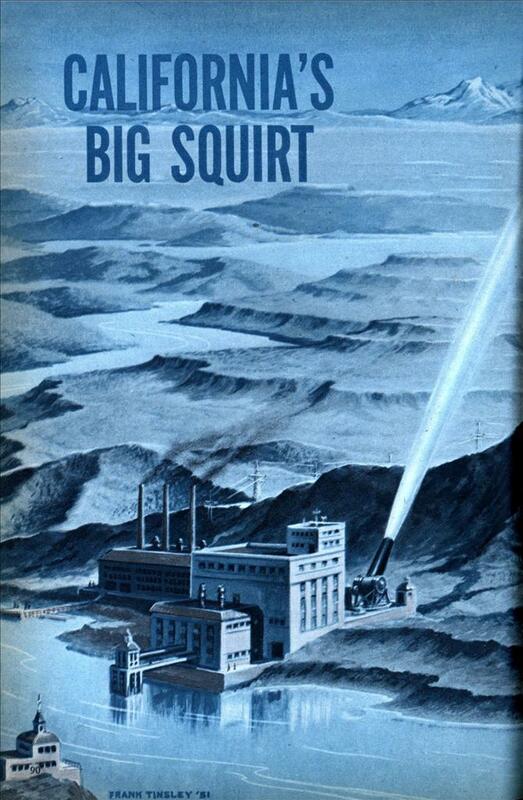 This was AFTER Hoover Dam and the California Water Project were built so the idea would be redundant at best. The idea of “flatter trajectory over the plains” shows he has no grasp of physics. You need a high trajectory to get distance. All you’d have to do after this is cover California with a giant plastic sheet and you’d have the world’s biggest Slip n’ Slide! I just think it would be really neat if the pumps were sequential, not continuous. It would be like a giant version of those dancing fountains at casinos. 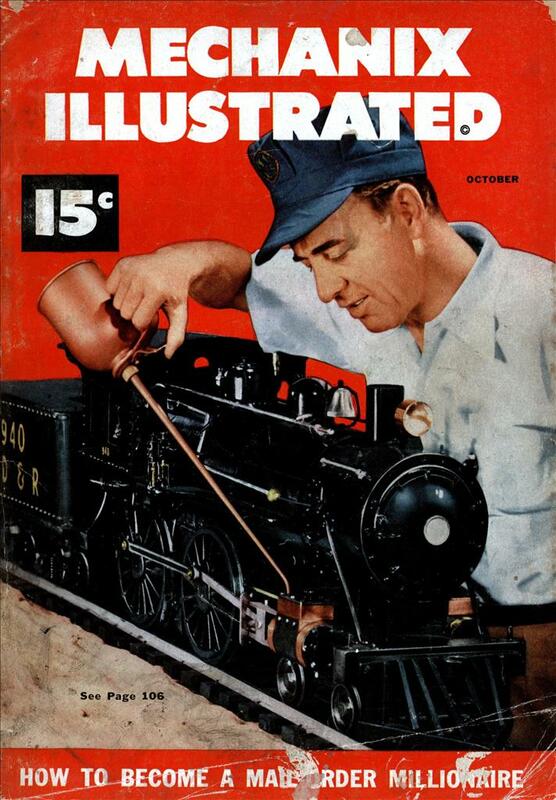 I suppose that in 1951, word of that new-fangled “pipe technology” as a means of transporting water was not widely known about. How about transmitting electricity via a series of lightning bolt-hurling Tesla coils positioned one mile apart? With enough Mentos, this might be a way to transport large quantities of diet soda from one location to another . . . .
Oh gee, it would have only been about a billion dollars in todays money. The average cost of pipeline in the US is about $11,000 per mile, so you could build about 90,000 miles of pipeline for the cost of this thing. Did these magazines have someone who looked for crazy ideas to publish when they needed filler or did they just have someone on staff just make stuff up on the spot. Distributing something by means of shooting it through the air is quite an old idea. In the early days of the British postal (mail) service, it was suggested that mail be placed in hollow artillery shells and fired from one location to the next. Since the cost of energy was aparently no object, perhaps they would freeze the water into giant bullet shaped molds to cut down on losses an improve accuracy. Is there a spell check on this thing? I keep making stupid spelling errors. Yes, the spell check sits in front of the keyboard.